La reunión contó con la participación de los Jueces de Agua de Corongo-Ancash y la junta de regantes de Moche (ambos de Perú), los miembros del Tribunal de las Aguas de la Huerta de Valencia (España), además de las autoridades de cada una de las regiones participantes. Al evento asistieron Karen Brown y James Brown de la Universidad de St. Andrews de Escocia ; Jorge Hermosilla , Vicerrector de la Universidad de Valencia; Luis Pablo Martínez , Inspector de patrimonio mueble en el servicio territorial de cultura en Alicante; y Karin Weil ,miembro del equipo chileno de EULAC Museums. 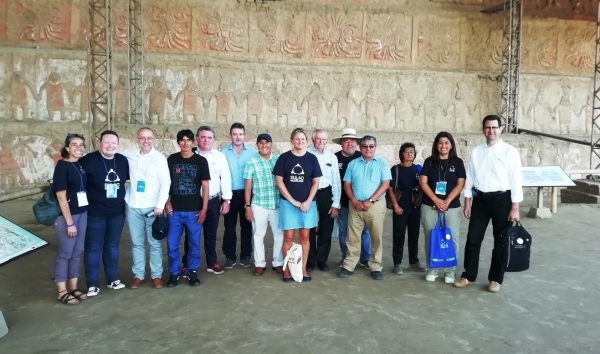 Durante el evento se realizaron visitas a las bocatomas del canal del río Moche, el Museo de Sitio Chan Chan, el Museo Huacas de Moche de la Universidad Nacional de Trujillo, Santiago Uceda Castillo; al sitio arqueológico Huacas del Sol , espacios donde se realizaron los talleres de trabajo que tuvieron como finalidad dar a conocer los saberes tradicionales que las generaciones actuales han recibido de sus ancestros y como constituyen parte de la identidad cultural de las comunidades que forman parte del proyecto EULAC Museums ( Perú.) . 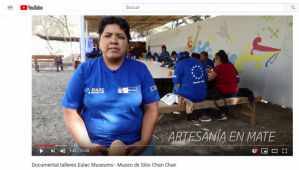 En el Museo Huacas de Moche de la Universidad Nacional de Trujillo, Santiago Uceda Castillo , el día 23 de marzo, se realizó la actividad “Gestión Cultural del Agua”, con la finalidad de dar a conocer los alcances logrados por el equipo responsable del proyecto en la región, también participaron la Junta de regantes del río Moche ,la junta de usuarios del agua de la Cuenca del rio Moche y como punto culminante de la reunión, se dio el encuentro entre los jueces del agua de Corongo. UNESCO declaró el 2017 al Sistema Tradicional de Jueces de Agua de Corongo de Ancash –Perú como parte integrante de la Lista Representativa del Patrimonio Cultural Inmaterial de la Humanidad, mientras que el Tribunal de Jueces del agua, de la Huerta de Valencia, inscrito en el 2009. El Tribunal de las Aguas está integrado por los miembros elegidos que representan a las comunidades de regantes. Además de sus funciones jurídicas, estos tribunales desempeñan un importante papel de símbolos visibles de sus respectivas comunidades, como lo demuestran los rituales observados cuando pronuncian sus fallos y su frecuente presencia en la iconografía local. Asimismo, contribuyen a la cohesión de las comunidades de regantes, velan por la sinergia de una serie de oficios, transmiten oralmente conocimientos emanados de intercambios culturales y poseen un vocabulario especializado. En suma, los tribunales de regantes no sólo son depositarios ancestrales de una identidad local y regional, sino que tienen también una gran importancia para las comunidades. 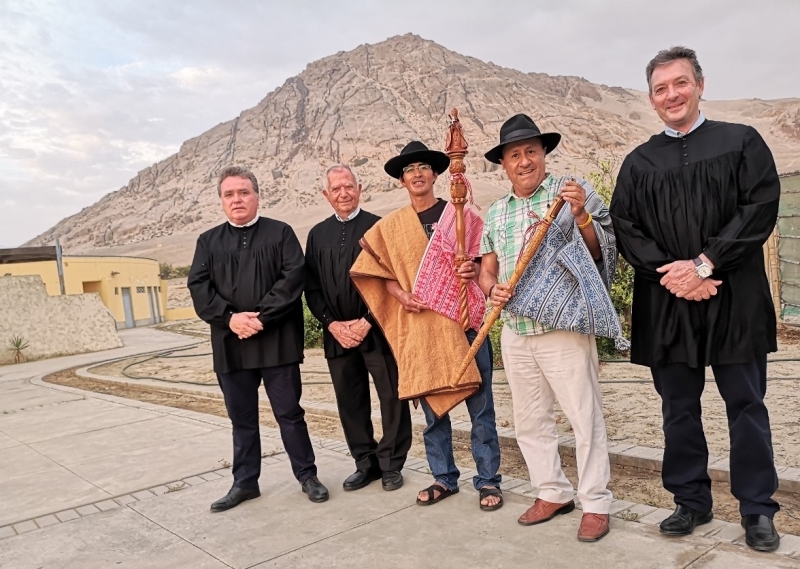 Esta actividad ha sido un espacio para el encuentro, el compartir y el reconocimiento de saberes tradicionales, entre pueblos de diferentes regiones, separados por la geografía, pero vinculados íntimamente por el manejo patrimonial del agua, cuyo día mundial es el 22 de marzo, este encuentro sirvió para recordar esta importante fecha entre los asistentes. The "Cultural Water Management" Bi-regional Europe-Latin America Meeting was held in the city of Trujillo (Peru) between the 21st and the 24th of March, an event coordinated by the Peruvian team of EULAC Museums, the Pontifical Catholic University of Perú (PUCP), the Decentralized Directorate of the Ministry of Culture La Libertad (DDC La Libertad), the Patronage of the Archaeological Project Huacas del Sol y la Luna (Moche) and the ICOM-Peru. This activity had been programmed since 2018 after talks between the teams of the Europe and Latin America regions. The meeting counted with the participation of the Water Judges of Corongo-Ancash and the board of irrigators of Moche (both from Peru), the members of the Court of the Waters of the Huerta of Valencia (Spain), besides the authorities of each one of the participating regions. The event was attended by Karen Brown and James Brown from the University of St. Andrews, Scotland; Jorge Hermosilla, Vice Chancellor of the University of Valencia; Luis Pablo Martínez, Inspector of movable heritage in the territorial service of culture in Alicante; and Karin Weil, member of the Chilean team of EULAC Museums. During the event, visits were made to the water inlets of the Moche river channel, the Chan Chan Site Museum, the Huacas de Moche Museum of the National University of Trujillo, Santiago Uceda Castillo; to the archaeological site Huacas del Sol, spaces where workshops were held that aimed to make known the traditional knowledge that the current generations have received from their ancestors and are part of the cultural identity of the participant communities of the EULAC Museums project (Peru). In the Huacas de Moche Museum of the National University of Trujillo, Santiago Uceda Castillo, on March 23rd, the "Cultural Water Management" activity was carried out in order to publicize the achievements by the team responsible for the project in the region; the Irrigation Board of the Moche River, the water user board of the Moche River basin also took part, and the meeting between the water judges of Corongo was the culmination of the meeting. In 2017, UNESCO declared the Traditional Corongo Water Judges System of Ancash-Peru as an integral part of the Representative List of the Intangible Cultural Heritage of Humanity, while the Court of Water Judges, of the Huerta de Valencia, registered in 2009. The Water Court is made up of the elected members that represent the irrigation communities. In addition to their legal functions, these courts play an important role as visible symbols of their respective communities, as evidenced by the rituals observed when they pronounce their rulings and their frequent presence in local iconography. Likewise, they contribute to the cohesion of the irrigation communities, ensure the synergy of a series of trades, orally transmit knowledge derived from cultural exchanges and possess a specialised vocabulary. In short, irrigators' courts are not only ancestral repositories of local and regional identity but also of great importance to the communities. This activity has been a space to meet, share and recognise traditional knowledge between people of different regions, separated by geography, but intimately linked by water management heritage, which world day is March 22, this meeting served to remember this important date among the attendees.